Capistrano Unified School District has had a relationship with The DBQ Project for the past ten years. 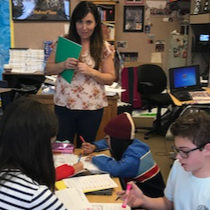 With the adoption of the Common Core and the C3 Framework, Social Studies Supervisor Nina Glassen and the social studies content lead teachers made a decision to stop using multiple-choice questions to assess student learning and use DBQ Project Mini-Qs instead. One of the keys to Capistrano’s success is that district and building leadership, as well as teachers, understand that instructional practices teachers use and the quality of student work are usually related. As data has come in, district and teacher leaders use the quality of student work to evaluate their own practice. All secondary teachers received introductory and follow-up training with Chip or Beth. Lead teachers in middle and high school received support to work in teams to write rubrics. For the assessment, teachers instruct students using The DBQ Method and students then write their essays alone. 85% of social studies teachers collaboratively calibrated student work against the rubrics. Teachers scored over 15,000 student essays using the 1-4 rubric. Students are doing significantly better. The number of students who are proficient and advanced grew in both 2016-17 and 2017-18. 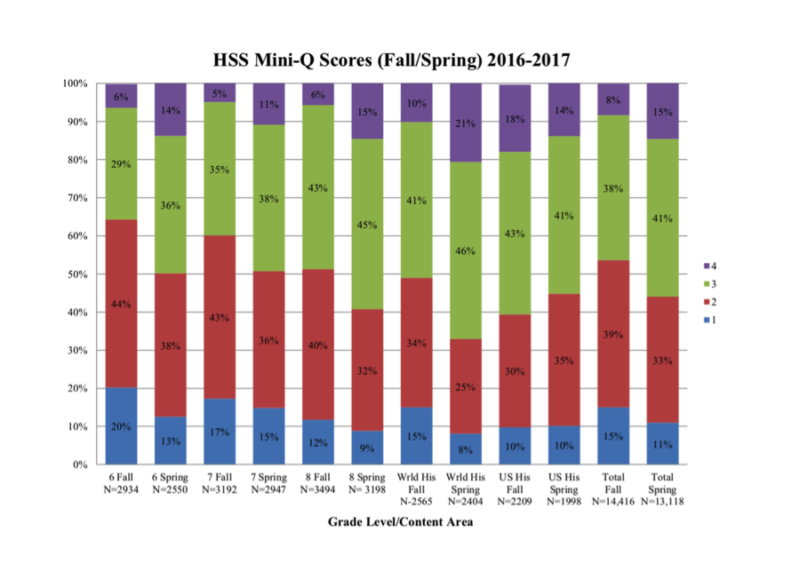 The following graphs compare the fall scores to the spring scores in two school years. 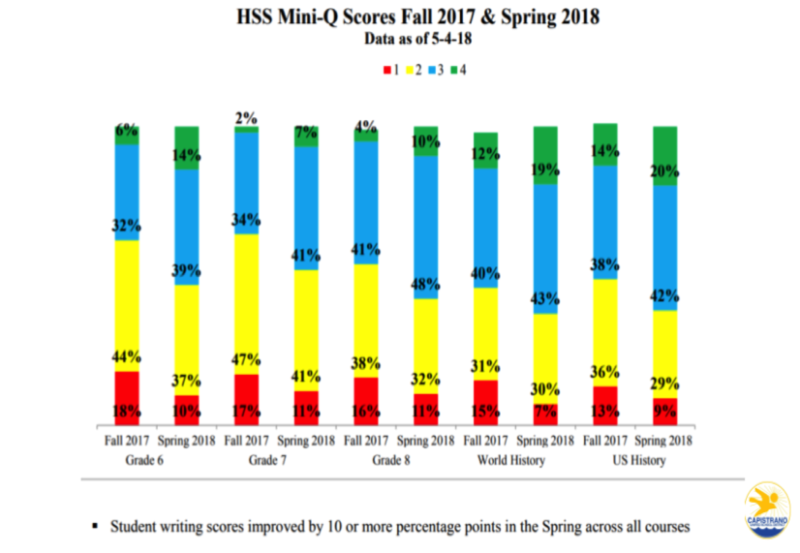 Data from the fall of 2018 shows that, although there is a slight beginning-of-the-year dip, high school students generally did better this fall than last spring. 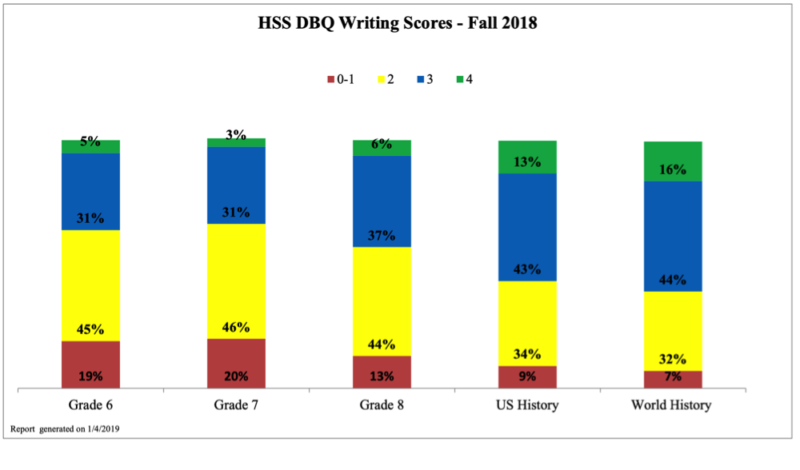 The dips in middle school are prompting principals to ask for district intervention to provide more focused writing workshops with general education students. How are leaders in Capo using the data? Teachers and principals receive the data each semester. District and teacher leaders developed intervention workshops with two goals: improve both instruction and student skills. Intervention workshops are popular but not mandatory. Students at a site are grouped according to the score they receive on the assessment and receive targeted instruction to help them grow. District leaders model the instruction. Interventions are designed to teach students Harris Moves, a strategy developed by C3WP, an affiliate of the National Writing Project. Teachers work in PLCs and continue to discuss ways to improve instructional practices. Using The DBQ Project materials as formative assessments is something many people talk about. The teachers and the leaders in Capistrano Unified School District have done a tremendous amount of work around professional development for teachers. The data helps gauge student abilities but the data is used to build stronger skills among teachers. This has improved morale and increased confidence as well as student work.